All the kickflips in the world couldn't stop Tony Hawk studio Robomodo from laying off staff. Things are looking bleak at independent studio Robomodo after rumors were confirmed that it was forced to lay off staff. 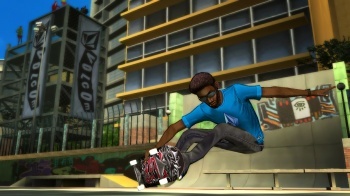 Known for Tony Hawk: Ride and the upcoming follow-up Tony Hawk: Shred, it's been revealed that these will be the last titles Robomodo will produce featuring the popular skateboarder. When Robomodo took over the long-running Tony Hawk franchise to add a life-sized skateboard peripheral in Tony Hawk: Ride, it didn't go so well. Though sales were said to be adequate, reviews were so bad that they pissed off Tony Hawk. Robomodo president Josh Tsui recently confirmed the layoffs while telling Gamasutra: "It is always difficult to let hard-working and valued employees go. Robomodo has retained all of the company's directors and leads, along with other staff members. All are busy working on future projects and ideas, which will become the innovative games of tomorrow." Tsui also said he hopes to bring some of the team back in the future. It's common for game developers to let staff go as they change from project to project, so what these layoffs truly indicate isn't clear. However, if Ride did well and Shred was expected to shred itself, it wouldn't be crazy for Activision to keep the franchise at Robomodo as it did with Neversoft through the first nine or so entries. Though Ride was an innovative idea, its high retail cost and fun-factor may not have been enough to justify future development. The question now is where Tony Hawk will go, because I seriously doubt Activision is done riding that gravy skateboard.